There’s a perfect piece of shapewear out there for every woman. Have you found yours? If not, plus-size fashion blog Fuller Figure Fuller Bust has 7 strategies to help you find shapewear that you truly love to wear. The glamorous fashion blogger Georgina, founder of Fuller Figure Fuller Bust, made a post about her excellent experience with a Rago #1294 girdle! 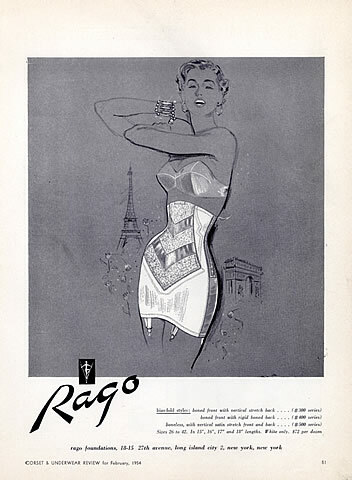 “Rago has been producing shapewear for fifty years and it is one of the most talked about brands put there. They were and are an American company who paid great attention to detail when it came to crafting that perfect piece of shapewear. They took customer feedback very seriously and based their pieces around people’s wants and needs, constantly evolving to suit them. Tim Hunter took an absolutely fabulous image of pinup model Amy posing by the real 1966 Batmobile in Rago Shapewear! Those knickers that Christina Hendricks (the actress that plays Joan Holloway in Mad Men) is wearing have the signature shaping bands and tummy panel that make them so recognizably Rago! Those are definitely the Rago #6101 knickers.